Ongoing conflict in the Mindanao region of the Southern Philippines has led to wide displacement of residents, lack of essential services, and high rates of poverty and youth unemployment. As in many regions of conflict, formal economic, educational, and civic opportunities are scarce—a combination of factors that pushes many young people toward participating in idle pursuits. EDC is working with the government of the Philippines and local partners to strengthen peace and stability in conflict-affected areas of Mindanao through the USAID-funded Mindanao Youth for Development (MYDev) Program. MYDev aims to actively engage out-of-school youth (OSY) in workforce and community development activities, contributing to incremental gains in mutual trust and social capital that underpin local area stability, security, and prosperity. 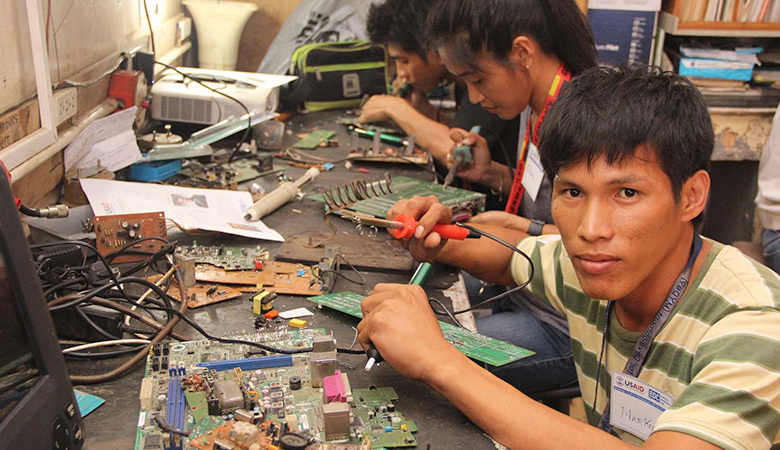 Read more about MYDev in "Welding Hopes and Dreams: Out-of-School Youth in the Philippines Forge a Brighter Future." Technical Education and Skills Development Authority (TESDA), Republic of the Philippines Department of Education; Bureau of Alternative Learning, Republic of the Philippines Department of Education; Local government units (mayor’s office); Southeast Asian Ministers of Education Organization (SEAMEO); Local service providers: Notre Dame University; Zamboanga-Basilan Integrated Development Alliance, Inc. (ZABIDA); Massachusetts Institute of Technology (MIT); Central Mindanao Integrated Livelihood Assistance and Resource Development Foundation, Inc. (CEMILARDEF); United Youth for Peace and Development, Inc. (UNYPAD); Nagdilaab Foundation; Technical vocational institutes. This report details the results of an impact study that was conducted to better understand the contributions of the Mindanao Youth Development (MYDev) project to improving skills and outcomes for out-of-school youth in the Mindanao region of the Philippines.